A History of the Land going back to earliest times is recorded in "A History of Northumberland, Vol. XI, written in 1922. It can be read online here. Page 246 from the Poll Book that both these last held lands in the township in 1748. 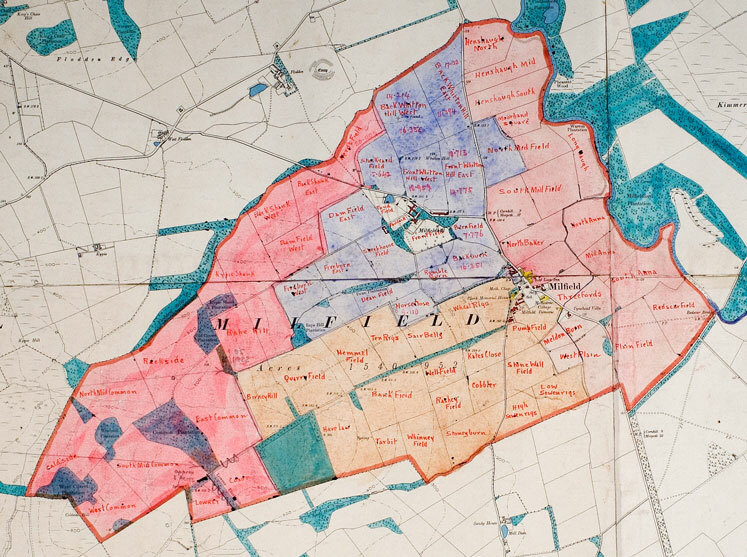 When in 1789 Milfield, otherwise Lanton, Common was enclosed, Sir Henry Grey received by far the largest allotment, amounting to 246 acres in respect of Milfield Hill, William Ord held Milfield Demesne and other lands, but received therefor only 87 acres, while Sir Francis Blake with 42 acres in respect of Milfield Ninths had the smallest allotment. (1) A portion of this last property, now known as the Manors, was sold in 1877 with Crookham, to which it lies adjacent, by Sir Francis Douglas Blake to the late earl of Durham, who bequeathed it to his second son, the Hon. F. W. Lambton. (2) The rest of the township later became the property of George Annett Grey, whose grandfather George Grey had owned Sandy house. (3) When this latter came to Milfield, 'the plain was still a forest of wild broom. He took his axe and, like a backwood settler, cut away the broom and cleared for himself a space on which to begin his farming functions. '(4) He farmed Milfield Hill, and on his death in 1793 his widow carried on his work, as his son John was only eight years old. John Grey grew up to manhood under the kindly inspiration of his neighbour George Culley, and he soon became a well known figure in the agricultural life of Northumberland. He was a great reformer, and championed such causes as parliamentary reform and the abolition of slavery, and, much to the surprise and horror of his friends and associates, was a constant advocate of the repeal of the corn laws. In 1833 he was appointed to take charge of the Greenwich Hospital estates, and he moved to Dilston. He never ceased to contribute largely to the agricultural literature of the time, working always on the principle that if agriculture was ever to rank with the other great sciences, 'the culture of the mind must precede that of the land. '(5) His son George Annett Grey bought Milfield Hill, of which he was already tenant, from Earl Grey in 1850,(6) Milfield Demesne from Charles William Orde in 1862,(7) and Milfield Ninths from Sir Francis Blake in 1877. The present owner of the estate is his great-grandson, Mr. John Neil Grey. (3 & 6 ) Milfield Hill Deeds. (4 & 5 )Memoir of John Grey of Dilston, by his daughter, Josephine Butler (London, 1874), p. 8. 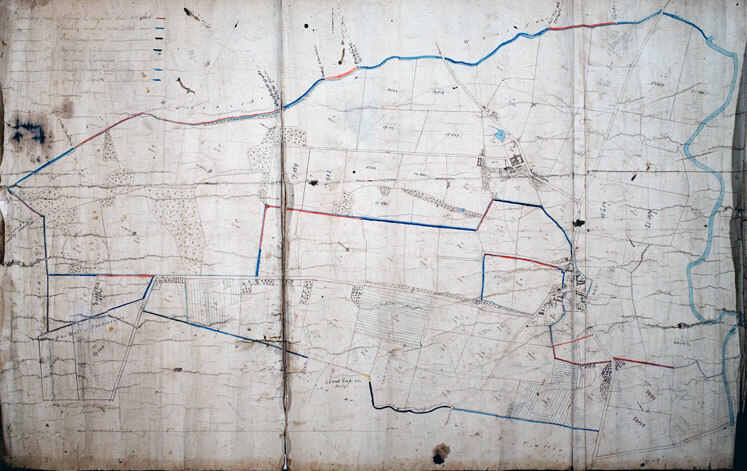 (3) There is mention of ' Le Milnefeld' as situated in Akeld and Akeld Strother in 1349 (Belvoir Deeds. drawer 2), but Akeld touches the modern Milfield at no point. Still there is a possibility that Milfield was known in the middle ages as Akeld Strother of which there is no other mention. (4)The Scottish chronicler gives the number as 300. (1)Hall, p. 556 ; Buchanan, Book xiii. vol. ii. p. 131. (2) This is doubtless Corkledge, a plantation beside the high road. It now lies in Coupland. (3) October 12th, 1515. Relation of the Misdeeds of the Scots dated March 15th, 1516 — Raine. North Durham, p. i.x. ; Letters and Papers of Hen. VlII . vol. ii. pt. i. p. 470. (4) Despatch from Surrey to the king, May 21st, 1523 — Raine. North Durham, p. x. (5) Cal. of State Papers, Domestic, 1640, pp. 615-616, 621. (6) Survey of the Border, 1541 — Border Holds, p. 34. (7)' Liber Feodarii, 1568 — Hodgson, pt. iii. vol. iii. p. Ixx. The place is spelt '.Mytfield' but the identification seems fairly certain. (8) North Country Wills, vol. i. p. 1S7. (9) Inq. p.m. a Eliz., Thomas Grey, kt.— Lambert .MS. ( 1) Will of Eleanor Collingwood, dated November 3rd, 1597 — Raine, Testamenta, vol. ii. p. 83. (3)Cal. of Border Papers, vol. i. p. 15. (4) Moneys levied at Northumberland Assize 11th .August, 6 James I. — Waterford Documents, vol. i. pp. 57. 58. (5) Lord Joicey's Deeds, vol. i. p. 53. He left his second son John his property in Slateraw in Ford. (6)Newcastle Public Library, Coleman Deeds, iii. 22. By his will dated 9th November, 1603, Henry Collingwood of Old Etal left to his son George all his lands in Milfield. He mentions his wife Margaret. (Raine, Tetlamenta, vol. i. p. 41.) It seems as though he was still living in 1618, and that George Collingwood of the conveyance was his son not his brother. (7)Freeholders of Northumberland, 1628, 1638 — Arch. Aeliana, O.S. vol. ii. pp. 321i, 323. Thomas Unthank of Milfield took a mortgage on a portion of the Ford estate in 1616. Lord Joicey's Deeds, vol. i. p. 55. (8) Book of Rates, 1663 — Hodgson, pt. iii. vol. i. p. 278. (9) P.R.O. Chancery Proceedings, Bridges, bundle 448, Nos. 116, 132 ; bundle 445, No. 117. See N.C.H. vol. vii. p. 223, where a pedigree of the family will be found. The "badger wood" was probably the wood marked on the above map as "Old Covert Plantation". It was on the left as you walked up the hill. 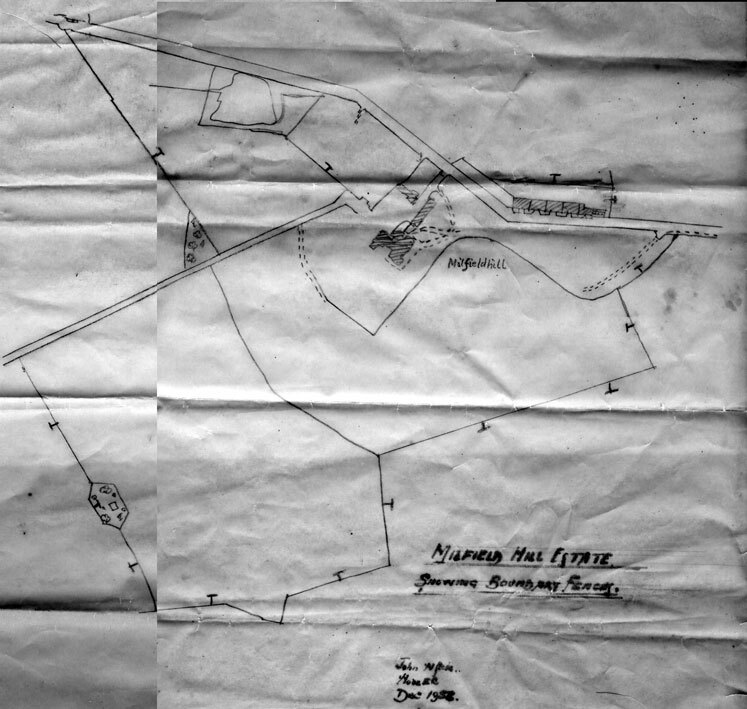 As can be seen from a comparison of today's satellite photograph with the old estate map the wood called Kypie Shank Plantation has gone, and may be one of the four that Robert refers to in his letter. The field names from the old estate maps have been put onto a modern Google map for comparison. A number of woods were cut down during WW2. The above map shows in its top left hand corner the key to the Boundary fences. Milfield Hill's are coloured red. Flodden Farm and the Ford Estate are blue at the top of the map. Crookhouse Farm fences are black. Milfield Ninths are blue. Milfield Demesne's have faded to being transparent, Sandy House at the bottom is blue as is Marley Knowe. 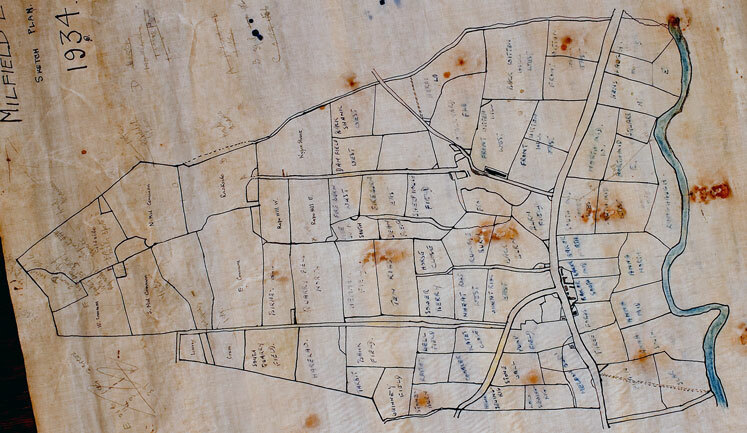 This is a home made map with the acerage of each field shown. Above the top boundary the Ford Estate is marked "Waterford" "Mr. T. Culley"is written on the bottom right. It is not dated. Below: This appears to be a more recent ordinance survey map. It show the three farms that eventually made up the estate brought together by George Annett Grey. It has the names of the fields written on each one. A map from 1934 , rotated for comparison with the others. It shows the field names but some of them have changed. Sair Belly has become Sower Berry. Wheat Rigs East is shown with no buildings in it. George Annett Grey bought Milfield Hill, of which he was already tenant, from Earl Grey in 1850, Milfield Demesne from Charles William Orde in 1862, and Milfield Ninths from Sir Francis Blake in 1877. 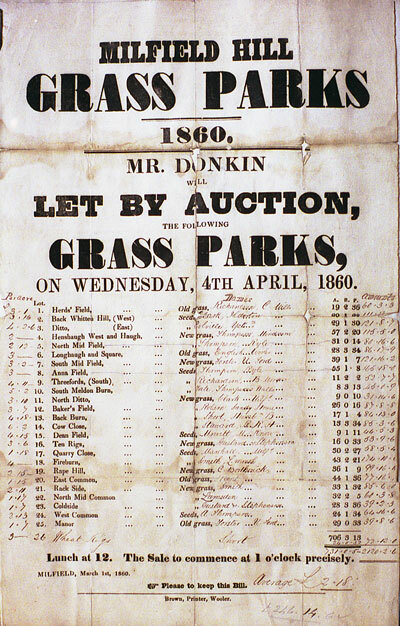 The poster for the grass park lets in 1860 shows the names of the fields that belonged to Milfield Hill before George owned the other two farms. By 1958 the land had been sold and the only fields left belonging to the house were the front field, sheephouse field, the stackyard, paddock and pond field. Some field names change. 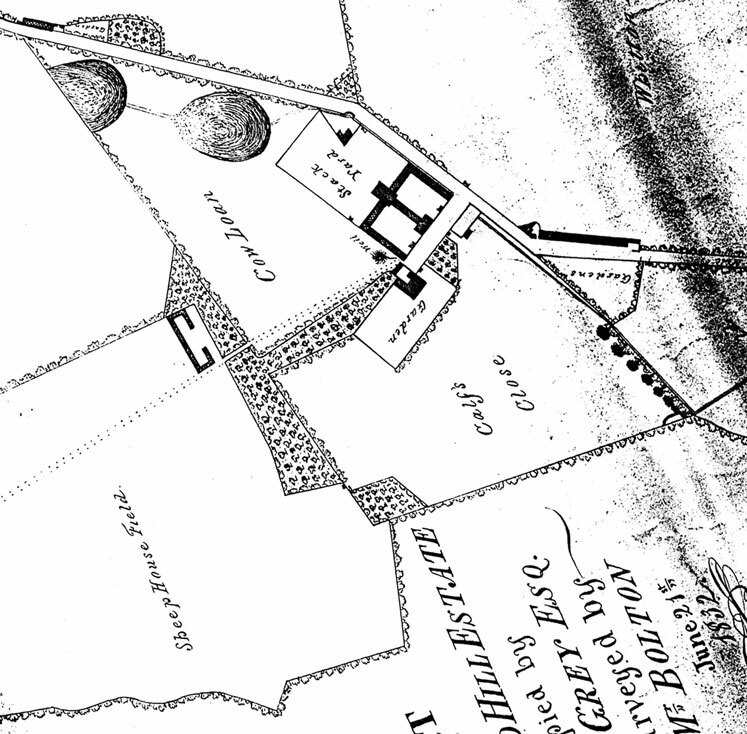 In 1832 the Front Field was Calf's Close, and the Pond Field was Cow Loan.